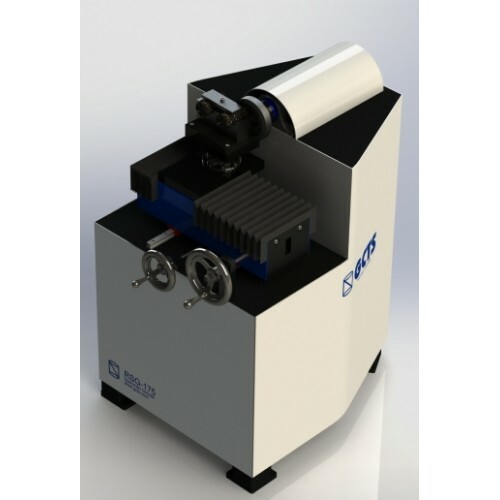 RSG-500 Specimen Grinder - OFI Testing Equipment, Inc. The GCTS Specimen Grinder provides the final step to preparing test specimens with parallel and flat ends according to ASTM and ISRM specifications. The grinder is driven by a heavy-duty 2.0 HP electric motor for durability. A diamond grinding cup-wheel is provided along with a sample holder which can be made in variety of sizes. The grinder comes with a 7" (177 mm) diamond cup wheel which can easily grind specimens from 25 mm to 150 mm diameter in a single pass. The RSG-500 can be supplied with the optional air cooling and dust collection systems. Also available is the optional automation upgrade for computer controlled grinding. Single-pass grinder with full specimen coverage to make core loading faces parallel and flat according to ASTM and ISRM specifications. Single-pass grinder with full specimen coverage to make core loading faces parallel and flat according to ASTM and ISRM specifications. 2 HP electric motor. Includes diamond grinding cup wheel, turn table and specimen holder for 50 to 76 mm diameter specimens.